Aberdeen Flowers have over forty years of experience in the floristry industry so if you are looking for funeral flowers, then our expert florists are able to tailor and create arrangements to your specific needs. On our website, you are able to browse a selection of funeral arrangements including casket tributes, posies and heart and cushion arrangements. 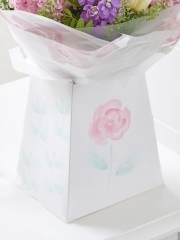 The Aberdeen Florists take into account different preferences which is why we offer traditional and modern designs, bright and pastel colour schemes as well as different themes, such as woodland. If there is nothing on our website which is fully to your taste, you are able to create a bespoke arrangement. You can either call us on 01224 633968 to speak to one of our expert Aberdeen Florists, email us or even pop by the shop. We have several funeral work catalogues that you are able to browse to see what arrangement would be most fitting. Our florists can recommend what the best options are for you or, alternatively, if you are happy to leave everything up to us, they will arrange something worthy. We understand that during such a difficult time, it is not always possible to do everything which is why Aberdeen Flowers will take full responsibility of the flowers. Once your order is placed, we take care of everything on your behalf so that’s one thing less to worry about. On the day, we will deliver the flowers to the specified address. Our drivers are experienced and drive carefully in order to ensure your flowers are not damaged. Let Aberdeen Flowers help you during this difficult time as our main priority is to provide you with total customer satisfaction. Aberdeen Flowers receives several fresh flower deliveries a week from different suppliers from Holland. Dutch flowers are universally acknowledged as some of the best in the world which is why we only ever use them. We have a large variety of flowers all year round ranging from varieties of roses; lilies including the popular Asiatic and Oriental lily; Alstroemeria; lisianthus; germini and gerbera to name just a few. All of these flowers come in different colours so, if you are looking for something more traditional, the Aberdeen Florists can arrange something in whites or creams. Alternatively, if you would prefer something brighter, that is also no problem as we have many vibrant flowers or if you’d prefer something in-between, we have beautiful pastel flowers and arrangements on offer. The cushion and hearts are all beautiful arrangements, visually stunning pieces of floral artwork. The Aberdeen Florists understand that, although this is a difficult and sad time for all those who knew the deceased, you want everything to be absolutely perfect during the ceremony as this occasion celebrates the life of the deceased as well as mourning the loss. Additionally, if you would like to send sympathy flowers to those in mourning, we have a collection of sympathy flowers available. Distance is not an obstacle for the team at Aberdeen Flowers as we are an Interflora member. Interflora is an international network, connecting hundreds of flower shops worldwide to enable you to send flowers when needed the most. That is our aim at Aberdeen Flowers, to make sure we are always there for our customers no matter what the occasion is. 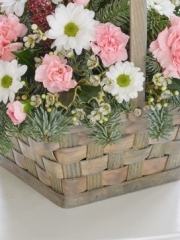 Aberdeen Flowers have a wide range of flowers suitable for funerals. In this very difficult time Aberdeen Flowers have a dedicated florist who can help you decide on the best flowers for the occasion. 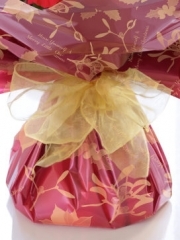 We have a wide range of different tributes to express your feelings of sadness and sympathy. 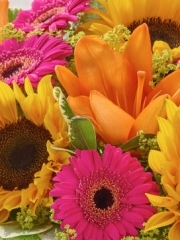 Our expert florists will handle your order with the sympathy that it needs. Our florists in Aberdeen have various tributes for you to choose from. You can order from our website or come into our shop to discuss what is most appropriate for you. The florists will be able to show you sample tributes we have done in the past. Established over 40 years Aberdeen Flowers have a wealth of experience to help you at this time. We have wreath and arrangements of various sizes and colours and themes. However if you would like something more unusual then our florist can create a design suitable for you. 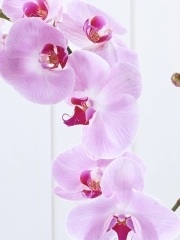 All of the flowers used by our Aberdeen Florists are of the absolute best quality. We have them imported to us from their site of cultivation in Holland so that we know that every single arrangement is made to a high standard. When you order funeral arrangements from Aberdeen Flowers we will make sure that it is just as beautiful as you would expect it to be. Our Aberdeen Florists will be sympathetic when dealing with your order and will create your flower arrangement with the respect it deserves. At Aberdeen Flowers we offer a delivery service that can bring your flowers to you anywhere in the UK and even abroad through a network of florists we trust to bring you beautiful flowers to fulfil your requirements. Our Aberdeen Florists can even have your flowers delivered on the same day when you place an order by 3pm. If you are ordering funeral flowers we can bring your arrangement to the funeral so that you don’t have another added worry in this troubling time. We want to bring you satisfaction as far as your Aberdeen Flowers are concerned so we will take every precaution to ensure that your arrangement is made and delivered perfectly and in top condition. Whatever your preferences for your Aberdeen Flowers, we will make sure to tailor your arrangement to them so that you will be pleased with the beauty of your flower arrangement. If you have specific preferences for the details of your arrangement our Aberdeen Florists will of course be willing to make it exactly as you would like it to be. At Aberdeen Flowers we also have a wide range of sympathy flowers which we can deliver even the Same Day. Our florists in Aberdeen will take care of you at this difficult time. You can trust Aberdeen Funeral Flowers with your order at this difficult time. If you would like to speak to one of our florists then please feel free to phone or come into the shop to speak to our expert funeral florist in Aberdeen.